On Wednesday, February 7, the OWLs, a group for those 55+, will travel to the Heider Center in West Salem to a Simon and Garfunkel tribute concert by the Gutherie Brothers. Meet at church at 4:30pm and travel to a local restaurant for a tasty dinner before the concert. Tickets are $22. RSVP to Brian at 608-526-9700 or owls@firstlu.org by tonight, February 4. In advance of First’s Annual Potluck on Sunday, Feb. 11, the 2017 annual report has been mailed to all member households in an abbreviated, one-page format. A full, more in-depth annual report may picked up at the Welcome Center or at the church office. Or click here to download a copy. Nominations needed! First Lutheran will elect two new members to the Vision & Leadership Team at the Annual Get-Together on Feb. 11. Read the following ‘job’ description, consider who you could nominate for this ministry, and email them to jason@firstlu.org. Position Summary: As a servant to the ministry of First Lutheran Church and working in conjunction with pastoral leadership, is responsible for development of the congregation’s mission and vision. Develops short- and long-term strategies for ensuring the spiritual and physical health and wellness of the congregation. Provides support to staff and congregation members to equip each member with skills to grow in faith and their own personal ministry. The 2018 La Crosse Area Synod Assembly is June 8-10 (Friday-Sunday) at Western Technical College, in La Crosse. An elected voting member will need to attend the assembly & various pre-meetings. If you are interested in serving our Synod and congregation as one of First Lutheran’s five voting members, contact Pastor Stanton or the church office. It’s a great opportunity to be the church! All members are invited to First’s Annual Potluck on Sunday, February 11, at 11:45am, where we will eat together and our kids will play together, all while the adults share our greatest faith stories from the past year. 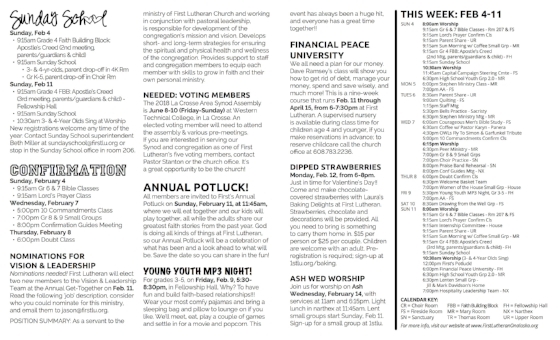 God is doing all kinds of things at First Lutheran, so our Annual Potluck will be a celebration of what has been and a look ahead to what will be. Save the date so you can share in the fun! For grades 3-5, on Friday, Feb. 9, 5:30-8:30pm, in Fellowship Hall. Why? To have fun and build faith-based relationships!!! Wear your most comfy pajamas and bring a sleeping bag and pillow to lounge on if you like. We’ll meet, eat, play a couple of games and settle in for a movie and popcorn. This event has always been a huge hit, and everyone has a great time together!! We all need a plan for our money. Dave Ramsey’s class will show you how to get rid of debt, manage your money, spend and save wisely, and much more! This is a nine-week course that runs Feb. 11 through April 15, from 6-7:30pm at First Lutheran. A supervised nursery is available during class time for children age 4 and younger, if you make reservations in advance; to reserve childcare call the church office at 608.783.2236. Monday, Feb. 12, from 6-8pm. Just in time for Valentine’s Day!! Come and make chocolate-covered strawberries with Laura’s Baking Delights at First Lutheran. Strawberries, chocolate and decorations will be provided. All you need to bring is something to carry them home in. $15 per person or $25 per couple. Children are welcome with an adult. Pre-registration is required; sign-up at 1stlu.org/baking. Join us for worship on Ash Wednesday, February 14, with services at 11am and 6:15pm. Light lunch in narthex at 11:45am. Lent small groups start Sunday, Feb 11. Sign-up for a small group at 1stlu.org/lent. On Wednesday, February 21, the OWLs, a group for those 55+, will have their February potluck at noon in Fellowship Hall. In conjunction with our potluck, First will host a “Before the After” class for all members of the congregation. The presentation will begin at 12:45 and serve as our program on that date. Participants have been invited to bring a dish to pass and join our potluck. “Before the After” is a planning tool to be used by anyone, any age, to outline your wishes, prepare and organize pertinent documents and eliminate possible tough decisions for your loved ones. The program will last two hours and is presented by Causeway Caregivers in La Crosse. Questions? Contact Brian Narveson at owls@firslu.org. First Lutheran Preschool provides developmentally appropriate early childhood education in a warm child-centered Christian environment. We offer Christian preschool sessions in the morning on Mon/Wed/Fri, Tue/Thur and Monday-Friday for ages 30 months and up. We are also a partner with the Onalaska School District, and we are a site for the 4-year-old preschool (4K). 4K runs Monday-Friday in the morning and includes busing. In addition there is Lunch Bunch Mon-Fri.